Ready for a Dose of Reality? Let’s just set aside the Alaskan reality shows for now. Yes, they’re entertaining, but sometimes the sustained hype is wearisome. Still we watch! You want reality? 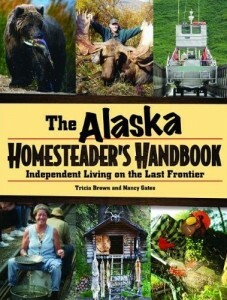 Here’s the real deal: my newest book from Alaska Northwest Books, The Alaska Homesteader’s Handbook: Independent Living on the Last Frontier. I partnered with Palmer, Alaska, resident Nancy Gates to interview forty-four Alaskans for this how-to book, so each “chapter” is a mini-profile coupled with a tip from that person for getting along in the wilderness. From tying useful knots, to putting in a winter waterhole through the river ice, to field-dressing your moose . . . you’ll be amazed at what these pioneers, old and young, have to teach! And all of the how-to segments are beautifully illustrated by Natalie Gates. Build an outhouse, lay the perfect campfire, overwinter your chickens. What works on the Last Frontier will work in your neck of the woods. So take a lesson or two from these Alaskans. Get yourself a copy and buy one for each of your friends! They’ll be in your favorite bookstore or online bookseller. Just ask for ISBN 978-0882408118.